The result is fantastic! My daughter just used a 4×6 canvas and standard photo. This was a family pic I had my sister-in-law snap back in the fall, and yes our Yorkie is in it, she is part of our family! My daughter just painted the sides and front of canvas black, then applied a thin layer of Mod Podge and placed the photo over this. She then “painted” a thin layer of Mod Podge over the top of the photo and let it dry. 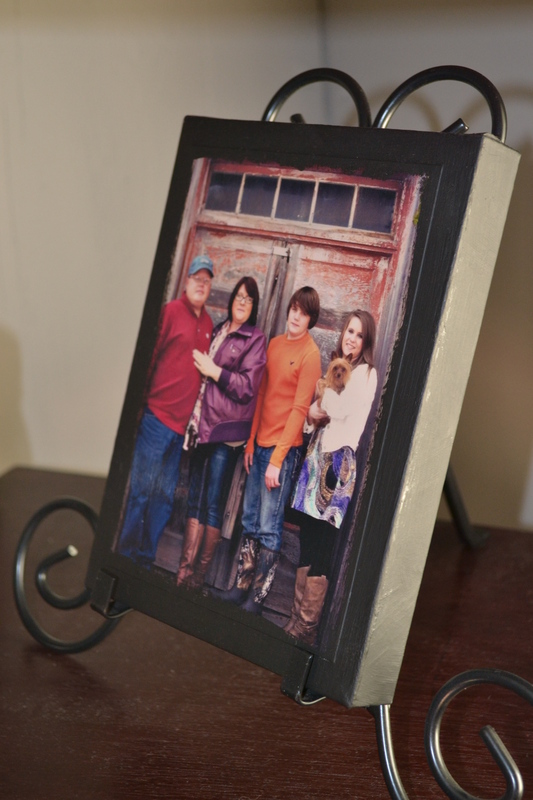 I found a cute little stand at Kirklands’ and it looks great on a shelf in my living room.I am wanting to order the large size photos’ from Staples and try using foam board, we shall see.